Phomopsis blight is a serious disease problem on eastern red cedar in Missouri. 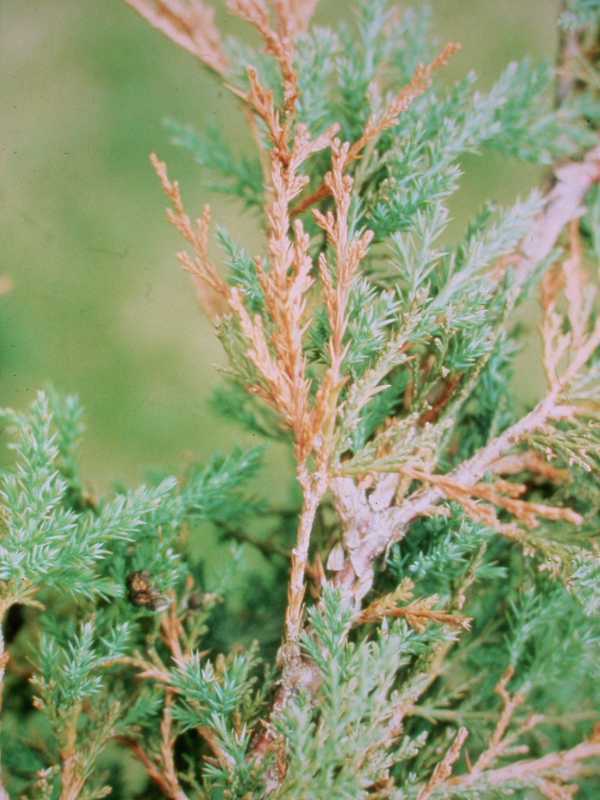 The fungal disease, caused by Phomopsis juniperovora, is widespread in this region and can infect arborvitae and cypress as well as juniper. Phomopsis is more of a problem on junipers in landscape plantings because young tissue is most seriously infected. Older plants are seldom killed by Phomopsis, thus it is not a concern in natural stands of juniper. The first sign of infection is the browning of needle tips. New shoots, in the yellow-green stage, will brown and die in their first summer. Progressive dieback follows, eventually killing an entire branch by girdling the stem. The fungus will progress to the main stem and can infect and girdle stems less than 1/2 inch in diameter. Infected needles turn light green, then reddish-brown, and finally an ashen gray. Phomopsis overwinters on needles and stems of young trees that were infected the previous year. The fungus is most abundant on dead tissue that has become ashen gray in color. Infective spores are dispersed by rain splash. Only seven hours of 100% humidity are needed for infection to occur when temperatures are 75 degrees F.
1. Prune infected branches to prevent the spread of the disease. Remove dead tissue as well. The fungus can produce infective spores for up to 2 years in dead parts of infected plants. Prune in late summer when the weather is dry. 2. Plant resistant evergreens. 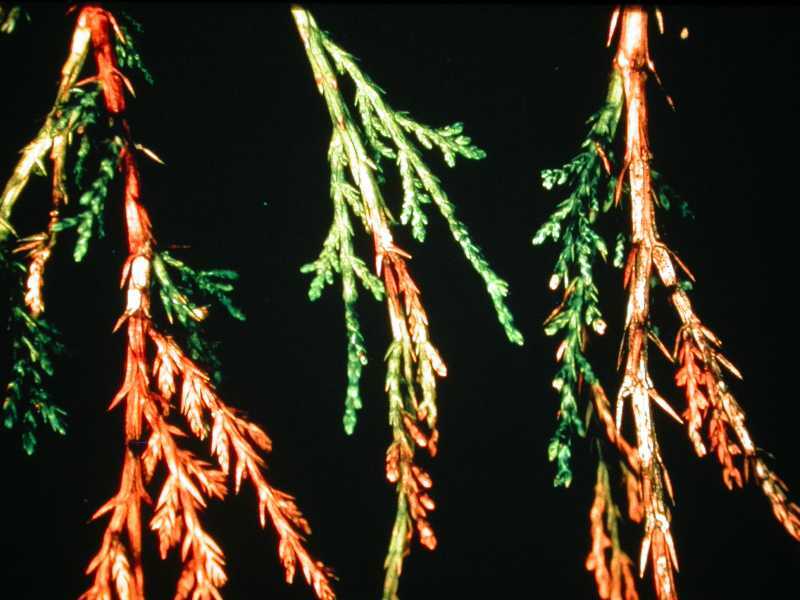 Susceptibility to Phomopsis blight varies considerably among junipers. Ask for resistant stock at your garden or landscape center or consider planting another type of evergreen. 3. Fungicides. Bordeaux mixture, other copper-based fungicides, and mancozeb are labeled for use on Phomopsis. These fungicides can be applied 3–4 times in the spring, at 10–14 day intervals to protect the new growth. They can be used anytime a flush of new growth occurs. Once the new growth matures in midsummer, discontinue further applications. Strategies 1 and 2 are strictly organic approaches. Of the fungicides mentioned in Strategy 3, consult the Organic Materials Review Institute (OMRI™) for appropriate organic copper products.